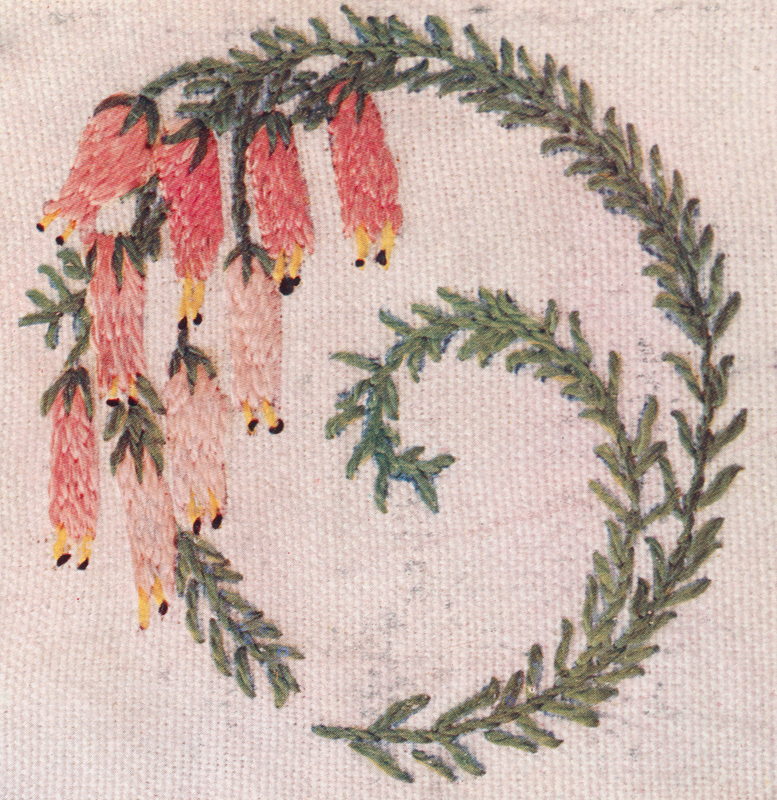 Florence Caulfield was an embroiderer and a specialist in South African flora. 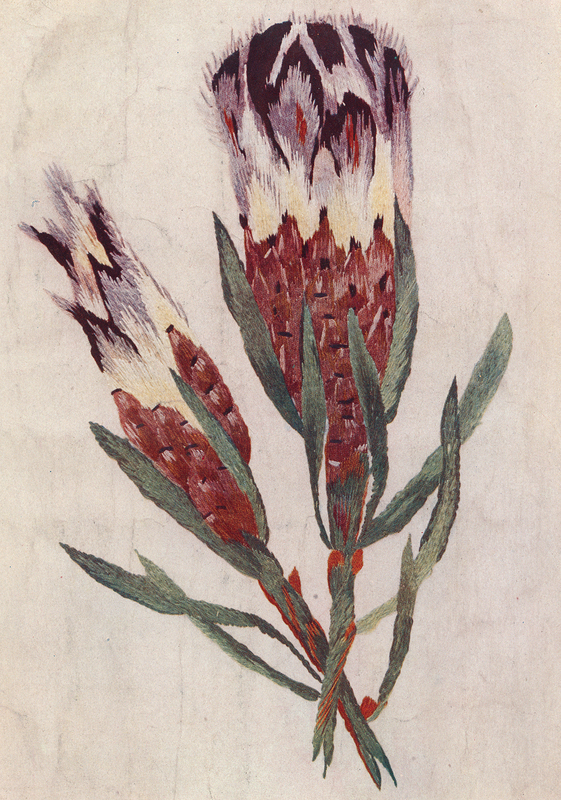 The National Art Library holds a proof copy of her book The Illustrated Needlework Book, conventional and natural designs of South African wild flowers. It was due for publication in 1914 by the St Catherine Press but it seems the outbreak of World War I that year may have put a stop to the project for there is no evidence that the book was ever published. As soon as Mrs Caulfield arrived in London in 1909 on a visit from South Africa she arranged to have her photograph taken by the fashionable Lafayette Studio wearing a dress she had embroidered with a design of grapes. Then she set about organising an exhibition of 52 of her 'needle paintings' at the Royal Horticultural Flower Show. Her work was bought by Queen Alexandra and the Princess of Wales, later Queen Mary, and this success led to one further exhibition before she returned to South Africa in 1910 and started to write her book. Hers was an ambitious scheme; the book included line drawings of her patterns as well as full colour photographs of some completed works. Many of these she stitched herself, preferring to hold the work in her hand rather than use an embroidery frame. 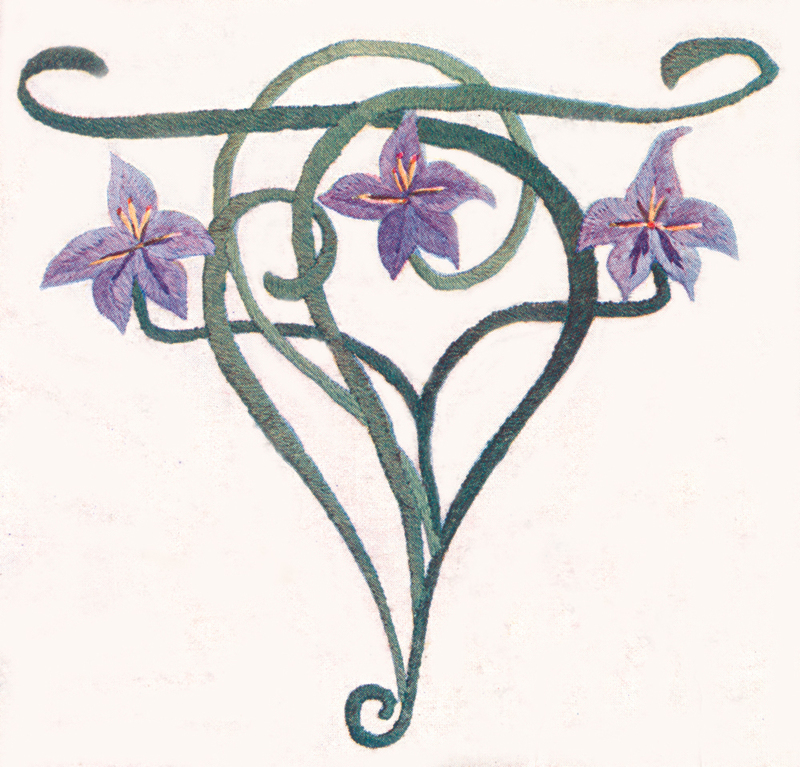 Some of her designs were naturalistic and other pieces were highly stylised in an Art Nouveau manner. She had strong views on what was appropriate. She liked solid embroidery and most of her work was done in satin stitch although blanket stitch was used occasionally. Her palette was limited and she generally recommended a single colour for any one leaf or petal. When shading was used the point of the flower was pale shading to dark and the darkest thread was reserved for the stems. The style depended heavily of the careful slanting of the filling stitches although with small flowers she felt the outline needed greater attention. The flowers in this embroidery have been stitched in a naturalistic manner whilst the stem curves round in an arch to fit with a series of designs based on circular motifs. Florence Caulfield suggested pink, mauve or yellow colour schemes. 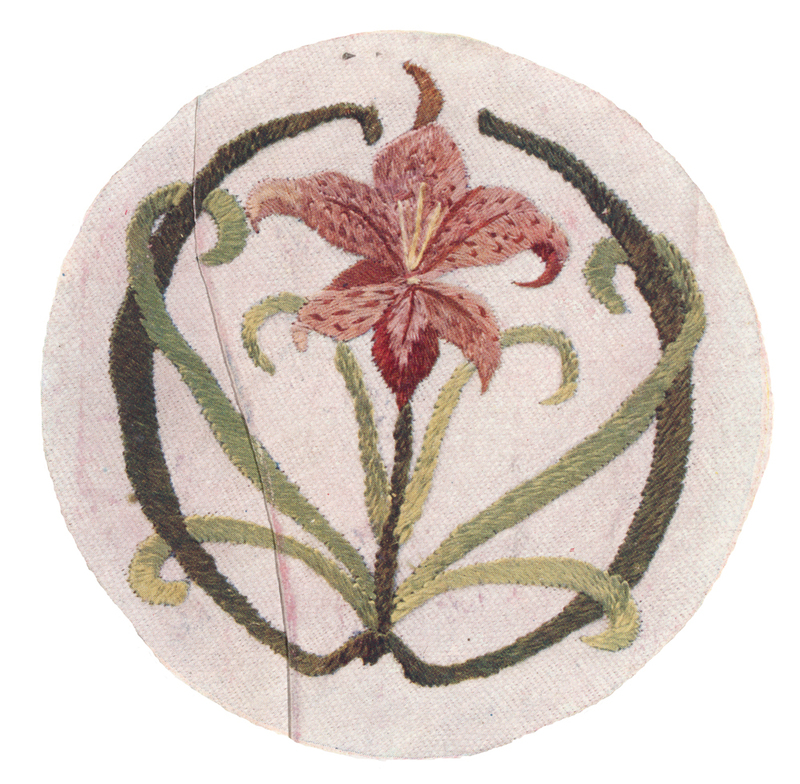 In this example of a design in Florence Caulfield's series of circular motifs, it has been difficult to stylise the flower but easier to deal with the leaves. This plant would be described today as Gladiolus maculatus, commonly known as the brown afrikander. 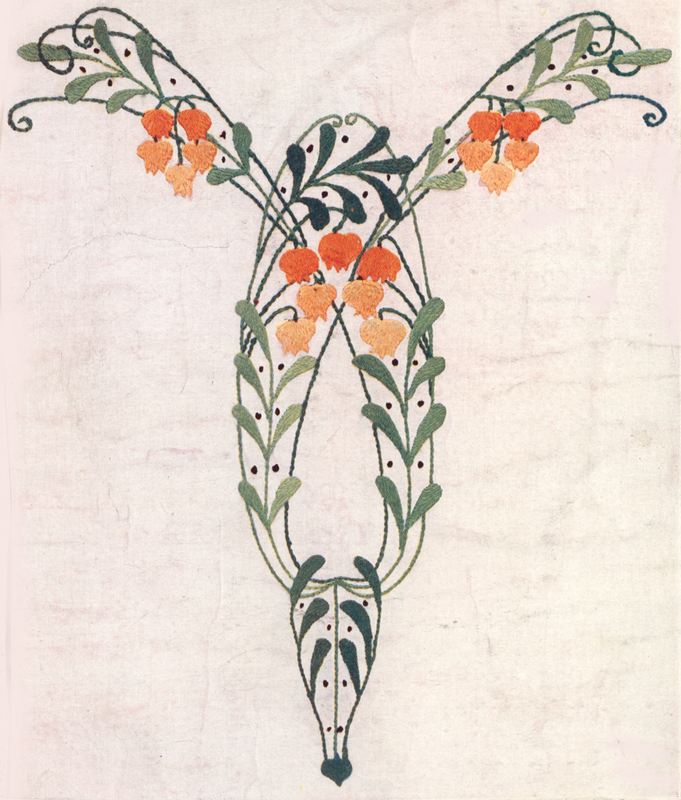 This is the only illustration Florence Caulfield gives of the use of tightly placed blanket stitches in the creation of her flower embroideries. The stitch make a strong outline round the edge of the colour blocks. This very beautiful rendering of the flower shows Florence Caulfield's skill in capturing the character of plants using simple stitches and a limited palette. She taught the importance of observing the outline and here straight stitches have suggested the texture of the bud. 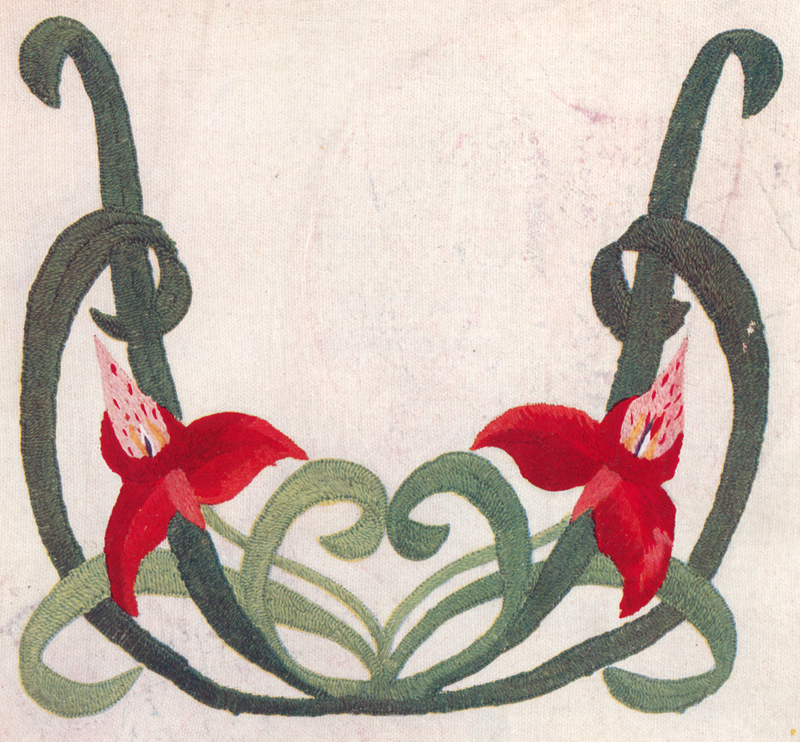 One of the characteristics of Florence Caulfield's plant embroidery was that she generally avoided shading in favour of solid blocks of colour. Perhaps because the proportion of stems and leaves here is so high, she suggested shading as a possible alternative to the three-colour shade version shown here. This plant is probably what would be described today as gladiolus carinatus, commonly known as the blue or mauve afrikander. This highly stylised version of heath creates a very successful embroidery design.